Electricity represents one of those mysteries most folks would prefer to avoid. Regrettably, for cruisers anyway, it’s pretty much unavoidable. I routinely help my clients troubleshoot electrical faults and failures from afar, and I’m reminded each time I do just how challenging this subject can be if you don’t work with it day in and day out. Several years ago, while I was the manager of a boatyard, after contending with numerous job applicants who claimed to know a great deal more than they actually could demonstrate, I devised a prospective marine mechanic’s and electrician’s screening exam. It consisted of 50 multiple choice questions evenly segregated into mechanical and electrical categories; if a candidate came along and claimed to know it all, and then some, the exam quickly separated those who could from those who could not. In some cases, the exam included a practical, in the form of a box full of numbered parts and tools that had to be matched up with their respective identifications. If you were very experienced, and you could differentiate a gram scale indicator from a glow plug, there was a possibility you’d get a perfect score. I didn’t consider it overly difficult and when I tested the content on my most skilled personnel, they obtained perfect or near-perfect scores. However, it was rigorous and many found it challenging—a fact that was demonstrated every so often by the behavior of some exam-takers. On a few occasions, I would check in on the candidate to see how he or she was doing only to find the chair empty, the exam partially completed; they were often never seen or heard from again. 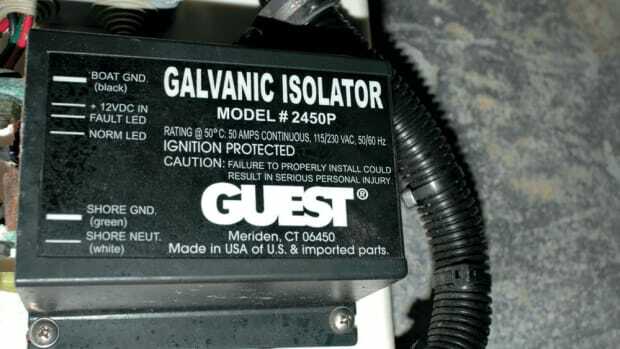 Invariably, the electrical questions that ensnared even many seasoned professionals involved the subject of series and parallel connections. While the concept in and of itself is anything but complex, many folks have a hard time fully grasping what it means and how it relates to real-world marine electrical systems, troubleshooting, and digital multimeter use. Perhaps the most common example, and just as commonly a frequent source of misunderstanding, involves batteries. Battery banks are often made up of individual batteries connected in parallel to provide increased amp-hour or reserve capacity as well as increased cranking amperage. In short, parallel electrical connections are created the same way terminals are connected, positive to positive and negative to negative. For instance, a single 12-volt battery of the 8D group size will typically provide about 250Ah of reserve capacity and 1300 cold cranking amps or CCA. If two of these batteries are connected in parallel, the figures essentially double with the notable exception of the voltage (demonstrating the electrical ‘no free lunch’ rule), the amp hours go to 500 and the CCA capacity (this is a measure of the number of amps a battery provides for 30 seconds at 0°F, not to be confused with marine cranking amps or MCA, which is measured at 32°F) reaches a dizzying 2600 amps. Adding more batteries to this equation has the same effect; voltage remains the same while amp hours and cold cranking amps are added. What if, however, the vessel’s electrical system is 24 volts, a scenario that requires a different battery arrangement to achieve that voltage? That changes the equation while continuing to observe the free lunch rule, albeit in an inverse manner. Two 8D batteries connected in series will yield 24 volts; however the amp hours and CCA will remain the same, 250 and 1300 respectively. Series connections are made by connecting positive to negative. While that may seem counterintuitive, it is completely natural to do so for disparate batteries. It’s the same process used to create 12 volts within a single battery, by connecting the positive and negative terminals of multiple individual cells within a single battery. These connections are usually, but not always, hidden under the battery’s case. Using the same series logic, 6-volt batteries can be connected in series to make twelve or 24 volts, with the same caveats, voltage is added while amp hours and CCA remain constant based on each individual battery’s capacity. 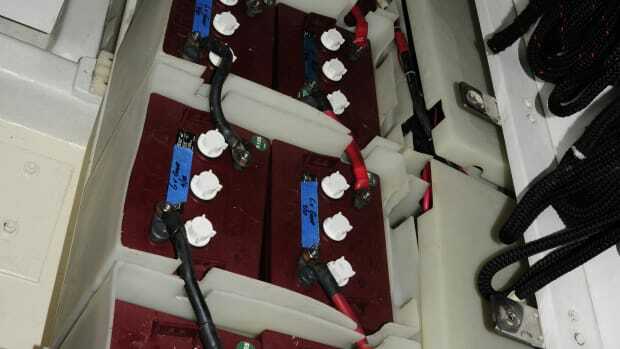 Connecting batteries in series has several advantages, chief among these being they resist charging and voltage imbalances that are common in large battery banks that consist of batteries connected in parallel. Very large battery banks may be made up of 2-volt batteries, twelve for a 24-volt system. Each of these may be rated at as much as 1200Ah. Here’s your test: if you create such a bank, for 24-volt applications, using these 2-volt batteries, what will the overall amp hour capacity of that bank be? While you are thinking about that, WWII diesel electric fleet class submarines used two-volt cells, 250 of them, (in two banks of 125 each), connected in series, providing 250 volts DC and 4000 amperes of current, which was used to operate electric propulsion motors and house loads while submerged. These batteries were behemoths; each was 18 inches square and 4-1/2 feet tall. The answer to the above question is 1200Ah; remember, when connecting batteries in series, voltage is added while amp hours remain constant. Large 24-volt battery banks are often created using an amalgamation of both series and parallel connections. Four 6-volt batteries may be connected in series to create 24 volts, essentially one 24-volt bank, groups of which are then connected in parallel to increase amp hour capacity. A thorough understanding of series and parallel is also required when working with measurement tools such as digital multimeters or DMMs. Voltage measurements are made in parallel, which means that after setting your DMM to volts DC (or AC if you are measuring shore power, generator or inverter voltage), the test leads are paralleled with whatever is being measured, the red test lead is placed on the positive battery terminal or source and the black test lead is placed on the negative terminal or source. Ampere measurements, on the other hand are made in series. For example, if you wanted to determine how many amps a light fixture used, you would separate the positive (or negative, it doesn’t matter) lead from the power source (perhaps a switch), and after setting the DMM to amps DC, insert the meter’s leads into the circuit, the red test lead on the power supply side of the circuit, and the switch terminal and the black test lead to the wire leading to the light, thereby completing the circuit. The DMM becomes part of the circuit, the lamplights and the meter reads the current flow, to a point. Most DMMs will measure current in this manner up to about 10 amps, after which an internal fuse will blow, hopefully before its circuits are damaged. If you wish to measure larger amperes, you’ll have to use an inductive amp clamp, a feature found on many DMMs today, which senses amperage via an electromagnetic field, without ever making contact with the wire through which the current is passing. If you can come to grips with the parallel and series concepts, many other electrical scenarios will begin to make more sense. Take the time to learn these precepts, as well as learn how to use your DMM—you won’t regret it.